Born Everard Jean Hinrichs in New York City (1905) he later changed his name to Eric to reflect his American origins —he pulled "eric" from the middle letters of America and choose Sloane in reverence to John Sloan, a leading figure in the Ashcan School of realist artists. An early interest in art was sparked by neighbors Herman Roundtree (illustrator for Field & Stream) and noted font inventor, Frederic W. Goudy. Hand-painted letters and signs feature prominently in Sloane's illustrated books. Some of his first clients included aviation pioneers flying out of Roosevelt Field, Long Island who asked him to paint the identifying markings on their planes. In exchange for painting lessons, Wiley Post taught the young Hinrichs to fly. Clouds and the sky would become central themes to his work. Among his early clients was Amelia Erhardt, who apparently bought his first cloud painting. His largest cloud painting graces an entire wall of the Smithsonian Air and Space Museum in Washington DC. After a falling out with his family, young Sloane ran away to become an itinerant sign painter. He worked his way across America, creating advertisements and painting signs on barns, buildings and stores. A deepening interest in weather caused Eric to enroll in the Massachusetts Institute of Technology’s meteorology program, but he left that program after becoming discouraged with the amount of mathematics needed. One of his professors half-jokingly suggested that Eric was looking for “romance” in the weather and would not find it at M.I.T. -stating he would be better off reading the almanacs and weather diaries of the early American farmer. It was a suggestion that would prove to be pivotal in the artist’s life and career. [This next part goes out to the FieldNotes crowd -ed] Taking the likely tongue-in-cheek comment of his professor seriously, Sloane began placing advertisements in Yankee Magazine to purchase farm diaries, journals and almanacs, and soon his living room was overflowing with tattered books and musty smells. As he read he indeed found the romance in weather he was looking for - descriptions of "violent" showers and "sudden" storms that cleared with a "sweet smelling aire". Fascinated by weather, The Farmer's Almanac and the early American farmer's ability interpret "weather signs", Sloane is even credited with being the first television weatherman... He came up with the idea of having farmers from all over New England call in their weather observations to a Dumont, New York TV station where they could be broadcast to the regional audience. Eric Sloane found more in those almanac pages... he became fascinated by the life of the early American farmer as he read of their knowledge of wood, the seasons, the stars. While restoring a Connecticut farmhouse in the early 1950's he began to further investigate the Early American settlers and concentrate on their building techniques. In 1956 he moved to Warren CT, where he kept a home until 1985. At a Warren Library book sale he is said to have found an account of New England farm life in the 1800's by one Noah Blake; that diary became the framework for Sloane's most successful book, Diary of an Early American Boy. Eric Sloane may arguably be the foremost authority on Early American rural architecture and Early American tools. His book A Museum of Early American Tools is considered an important source work on the subject. The Sloane Stanley Museum in Kent, CT houses Sloane's own personal collection of Early American tools -adding it to my list now. 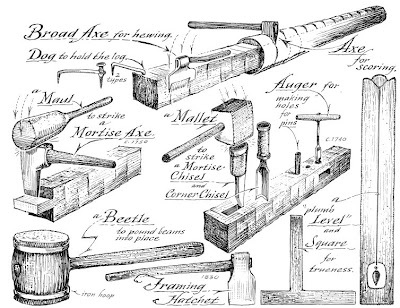 Another book, A Reverence for Wood is an invaluable resource to scholars of old growth timber in New England, covering such topics as; the aesthetics of wood, wooden implements, and carpentry. Slone remarks with affection on the resourcefulness of early Americans in their use of this precious commodity. Some nice person has scanned Reverence and posted it. Get in there. Phew... Long/short I am eating this stuff up. The line drawings and lettering style are not for everyone but you have to admire his drafting skills. 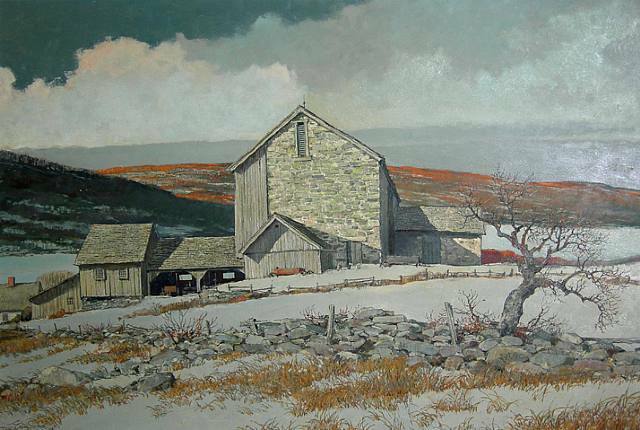 The more colorful barn paintings that have been reprinted ad infinitum may seem slightly cheesy (touse the academic term) but only because they have since been co-opted as a quintessential New England barnscape default. I'll go to the mat for the washed out ones though, all greys and old shingles. Our copy has a different cover and sure could post pages all day... Last year I noticed UVM had started a Vermont Barn Census, Sloane's book below has to be essential reading for that. 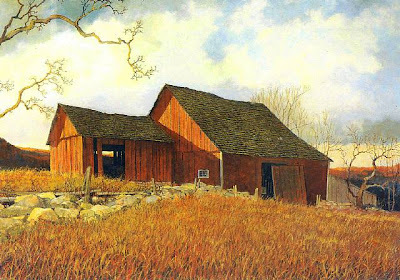 "Few buildings of the past remain to speak as plainly of the early American economy as the old stone farm buildings." -Eric Sloane, I Remember America, 1971.